Goals for revision | Thinking is the enemy. 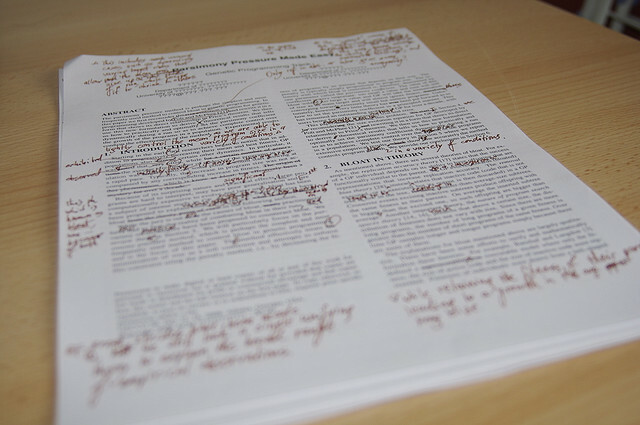 “2008-01-26 (Editing a paper) – 14” by Nic McPhee licensed under CC BY 2.0. I’ve written about my book-mapping process before. Now that I’m finally done mapping all 78 scenes for my book, I can gird up my loins for the hard work of revision. The most important thing to me is what the book is about — not the action, but the theme. Is the book I wrote different from the one I thought I was writing? And if not, what do I need to do to fix it? Once I have a firm grip on what the book wants to be about, my entire revision can be anchored by that concept. Identify scenes that can be cut or need to be rewritten. Draft any scenes that need to be added. Cut or combine unnecessary characters. Round out characters who seem flat. Check consistency of character voices in dialogue. Balance the emotional and action plots. Make sure the chronology of events makes sense. Consistency of world physics, i.e., magic and powers. A lot of this is Big Picture stuff. In addition to that, there’s the detail work: grammar, sentence and paragraph structure, rhythm, image, diction, etc. What do you think about as you start revision? Let me know in the comments. This entry was posted in Writing and tagged revision, writing. Bookmark the permalink.